The 'Help' screen, accessed by tapping 'Help' on the bottom of the screen, enables you to visit the HypnosisDownloads.com Help Center and log out from the app. 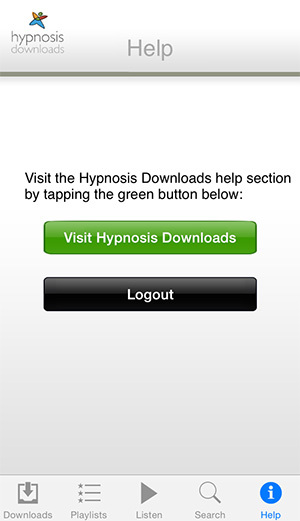 'Visit Hypnosis Downloads': Tapping this button will open the HypnosisDownloads.com Help Center in your mobile browser. There you can browse our Frequently Asked Questions (FAQs) for answers to common questions, retrieve lost downloads, and contact our Uncommon Care Team if you need further help. I need help with something else. My question isn't answered here!